This Wednesday, November 12 02014, the European Space Agency‘s Rosetta Mission will deploy the Philae lander onto the 67P Comet after over a decade-long journey. 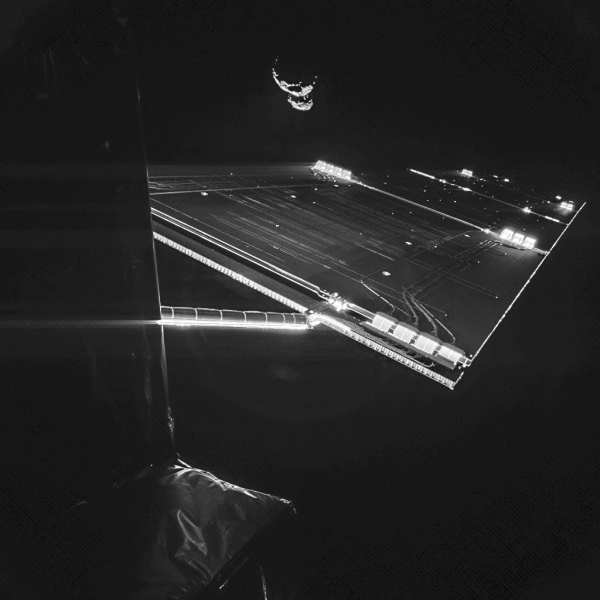 When this mission was first conceived, the ESA asked to put one of Long Now’s Rosetta Disks on the craft, making the Rosetta Probe the first off-world long-term archive of human language. To honor the culmination of this historic mission, ESA has released a short science fiction film imagining the potential legacy of the Rosetta Mission. This dramatic, inspiring short was directed by Tomek Bagiński and co-stars Aidan Gillen (of The Wire and Game of Thrones). It’s a reminder of how historic this mission truly is. You can watch the live stream of the Rosetta Space Probe sending it’s lander to Comet 67P, from 6:00am to 9:00am PT on November 12 02014. Here in the Bay Area, The Long Now Foundation is partnering with the Chabot Space Center and swissnex SF to host a breakfast event at the Chabot Space & Science Center. The event will feature the live stream and our own Dr. Laura Welcher giving a presentation about the Rosetta Disk, as well as Chabot’s staff astronomer Ben Burress and a live Skype with Kathrin Altwegg from the European Space Operations Centre, Darmstadt. Doors & breakfast are at 6:00am; tickets and more information can be found here.